Info "Catch the ball in the basket! Was that so hard to figure out?" Basket Case is a microgame found in the Total Drag stage in WarioWare: Touched! The microgame's name is a pun on the phrase "basketcase". 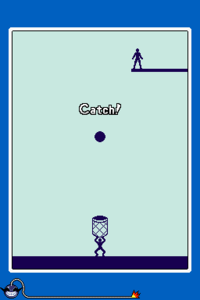 The objective of the game is to drag the man with the basket to catch the bouncing object. 1st level difficulty: A simple ball is dropped. 2nd level difficulty: A smaller object is dropped. 3rd level difficulty: An object that resembles a UFO is dropped. The game was originally meant to be long. If the timer of the microgame is set to endless via the debug menu and the ball isn't caught for a long time, the two people will drop to the floor. This page was last edited on February 23, 2019, at 15:34.